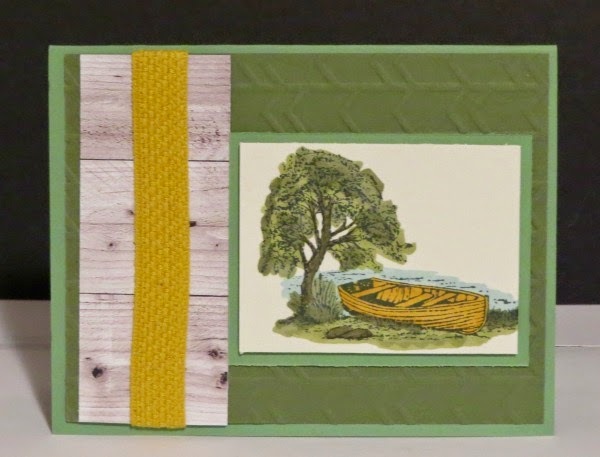 Karina's Kreations: Moon Lake Card! I wanted to share this cute swap card I got from Carmen Reimer. She used the new stamp set Moon Lake. This set has 3 great nature images. My favorite part of the card is the designer paper. We carry this new Adventure Bound Designer Series Paper that looks like a photograph. It's perfect for masculine cards. To order your stamping supplies click here! Remember that you earn a Sale-a-bration item with every $60.00 you spend. You can earn your Blendabilities markers as one of your items!